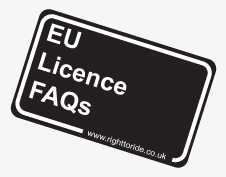 Welcome to our FAQs page regarding the 3rd DLD (EU Driving Licence Directive) and its introduction to Northern Ireland on 19th January 2013 . Our thanks to The Driver and Vehicle Agency (DVA) www.dvani.gov.uk for providing the majority of the information below and MAG Ireland for their list of popular motorcycles to show which fall into which licence categories. If you have any questions, which are not answered below, please get in touch and we will endeavour to find an answer. Further information on all changes to all licences are available at nidirect governement services. Get On’s Routes to Riding chart breaks down the new motorbike licensing laws, making it easy for you to see the exact path you need to take to get on two wheels! Get On is a Motorcycle Industry funded campaign which aims to introduce as many people as possible to the fun, freedom and financial savings that can be made when you learn to ride a motorbike or scooter. There are over 100 centres around the country, including Northern Ireland, that offer a free motorcycle training session allowing you to experience for yourself just how easy it is to ride! All the kit is provided and you get personal guidance from a trained professional in a safe and secure area away from cars so you can relax and enjoy yourself. 1. What is the EU Third Directive? Driving licence rules in Northern Ireland stem from European laws – namely the Second Directive on Driving Licences (91/439/EEC). From 19th January 2013 a new Directive – the Third European Directive on Driving Licences (2006/126/EC) will come into force. The Directive will introduce changes to driver licences and licence acquisition arrangements by harmonising definitions of vehicle subcategories within Member States. Furthermore, it introduces minimum standards for driving examiners and attempts to ensure that no one can at any one time possess more than one licence issued by an EEA state. 2. When will the changes happen in Northern Ireland? All requirements of the 3rd Directive will come into effect from 19 January 2013. 3. What will the changes mean for the motorcycle industry? The current entitlement, which enables motorcyclists to ride any size of motorcycle 2 years after passing the category A motorcycle test, will be removed. 4. Who will be affected by the changes? Motorcycle examiners, Approved Motorcycle Instructors (AMIs) and moped and motorcycle learners will be affected by the changes to motorcycle licence and qualification arrangements. 5. Why are motorcyclists being targeted? These new EU rules introduce measures that will make motorcycling safer as it will ensure that motorcyclists gain access to more powerful motorcycles by means of experience and/or age. 6. What are the new moped and motorcycle categories? 7. What is Progressive Access? The new EU progressive access (also known as “staged access”) rules impose minimum ages on persons under the age of 24 years who wish to ride more powerful motorcycles. These younger riders will be obliged to qualify and gain a minimum of two years experience riding a less powerful machine before they can take a test for a higher category of motorcycle The period of two years experience will start from the date you receive full licence entitlement for the lower category. Under the progressive access route, riders will be able to access the largest motorcycle, category A, at age 21, provided they have held the full A2 for a minimum of 2 years. 8. What is Direct Access? 9. Will a training option to progressive access be introduced? The training option to progressive access was consulted upon in the 3rd EC Directive on Driving Licences Consultation paper. Due to the costs associated with implementing the training option, the Department decided to proceed with the testing option. Although the Department will initially proceed with the testing option; the training option will be considered post implementation of the testing option, and will include stakeholders in the development of any such training. 10. What are the minimum test vehicle requirements? For Progressive Access, candidates must have held a full A1 licence for a minimum of two years and take the practical tests.For Direct Access, candidates must hold a valid CBT certificate (completed on an A2 or A motorcycle) and theory test certificate and take the practical tests. A three-wheeled moped or motorcycle is only suitable for test if the distance measured between the centre of the area of contact with the road surface of the two wheels is less than 460mm (46cm). It’s likely that these vehicles won’t be suitable for test from 19 January 2013. 11. Will the minimum test requirements for motorcycles change? The European Union is considering making further changes to the new rules for motorcycles used for riding tests. The proposed changes to the rules will decrease the minimum kW output for A2 motorcycles from 25kW (approx 33.5 bhp) to 20kW (approx 27 bhp) which will increase the range of motorcycles available. The earliest these proposed changes will come into effect will be the end of 2013. • a change for the largest of motorcycles (Category A) with an increase from 40kW to 50 kW. This will also include a minimum weight of 180 kg (unladen mass weight). If the proposed amendments are accepted by the European Council and Parliament this will mean that there will be new minimum test vehicles from 19 January 2013 which may change again at the end of 2013 to reflect the new criteria specified above. The amendment has now been approved however there will be a longer lead in period, until 31st December 2018. 12. Will a motorcycle theory test be required for access to all the motorcycle categories? For direct access a candidate will be required to present a valid (less than 2 years old) motorcycle theory test certificate. If a candidate opts for the progressive access route, the candidate is not required to take a theory test each time they want to step up to the next category e.g. A1 to A2 to A provided they have obtained a full licence. The full licence entitlement of the lower category will cover the candidate for the theory test. However, if a rider has a full A1 licence and wishes to acquire A at age 24, without acquiring A2 previously, a valid theory test certificate would be required as this would be classed as direct access. There is no progressive route from AM to A1, therefore if a candidate at the age of 16 takes a theory test and practical AM test and at the age of 17 decides to take an A1 practical test; they will not need to take a theory test if certificate is still valid. 13. If a candidate gains full category A1 at 17 but decides not to sit an A2 category test but returns at age 24 to gain their full category A, will another theory test need to be completed? Yes, the candidate will be required to present a valid (less than 2 years old) Motorcycle Theory Test Certificate – therefore they will need to do another theory test. 14. Is Compulsory Basic Training (CBT) required for access to all the motorcycle categories? 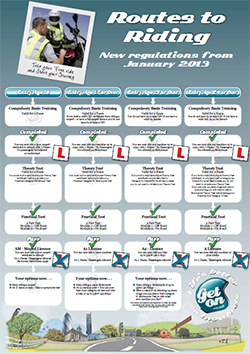 All learner riders must complete a CBT course before riding a moped or motorcycle on the road. A candidate who has passed a moped test will not require CBT for category A1. If a rider has completed CBT on a moped or A1 motorcycle, they will be required to complete an additional CBT course on an A2 or A motorcycle as the rider will not have been trained at speeds in excess of 45mph. However, if a candidate has passed an A1 test and gained two years experience they will not require CBT for A2 or A (provided they meet the relevant age requirements) as they will be have been able to gain one year’s post-test experience riding at speeds in excess of 45mph. 15. Does the off-road manoeuvres test need to be completed for progression to each of the categories? Yes. The motorcycle test consists of both the off-road manoeuvres test and the on-road practical test, therefore a candidate would be required to pass both these elements before they would be awarded full entitlement to either category A1, A2 or A. 16. Can full category P (moped) be used as entitlement to take a motorcycle test? No, for tests from 19 January 2013 full category P (moped) will no longer be accepted as entitlement to take a motorcycle practical test. Category AM (moped) will replace category P (moped) but this will be classed as a separate category to A1, A2 and A. 17. Will I be restricted to riding at 45mph? Proposals are currently with the Minister to remove the 45mph speed restriction requirements for categories A2 and A only, while being trained and tested and also for post test. It is intended these new measures will be in place on 19 January 2013, however the rider must still display an R plate, even if this restriction is removed. 18. Will these new changes mean an extra cost for riders wishing to progress to larger motorcycles? Depending on a riders age and how quickly they wish to progress to the larger motorcycles, some candidates may have to take additional tests to obtain a large motorcycle (category A) licence under the age of 24 if they opt for the progressive route. Statistics show that approximately 80% percent of test candidates are aged 24 years and over, therefore the majority of NI customers may prefer to take the direct access route, which would reduce the increased costs associated with progressive access. 19. What happens if a candidate passes their category A motorcycle test prior to the Directive? Riders who passed their category A motorcycle test prior to implementation of the directive will still be restricted to motorcycles of 25kW for two years from date of test pass. However, from 19 January 2013, if a rider passes Category A at age 24, they will not be restricted for 2 years, they will be able to ride motorcycles above 35kW. Also, from 19 January 2013 a rider who is within this 2 year power output restriction period will be able to take a further test in category A2 at 19 years or category A at 24 years to remove this 25kW power restriction. 20. What happens if a candidate passes their Category A off-road manoeuvres test prior to introduction of the Directive, but does not pass their Category A on-road practical? Both elements of the motorcycle test, the off-road manoeuvres test and the on-road practical test, must be passed before entitlement to a motorcycle category is awarded. If the off-road element is passed before 19 January 2013 and the on-road practical test has not been completed before this date, the candidate can only be awarded the category that they are entitled to once they have passed both elements of the test. On or after 19 January 2013 you’ll only be able to take your tests on the category of motorcycle described in the right-hand column of the table above. If successful, you will get the category of licence as listed in that column. Age restrictions on riding larger motorcycles will apply and the existing entitlement to upgrade a restricted category A1 or A2 licence after two years ends on the same date. To ride a larger motorcycle, you’ll need to be old enough to take and pass the test on the larger size motorcycle. 21. If a candidate has a full A1 licence, do they still need to be accompanied by an AMI when learning to ride A2 and A motorcycles? Yes, if a candidate is riding medium sized (category A2) and large (category A) motorcycles on “L” plates on a public road, they must be accompanied by an AMI at all times. 22. Will these changes have any impact on tricycle riders? Yes. From 19 January 2013 category B1 (quads and tricycles) will no longer be granted as a sub-category of category B and there will also be changes to how tricycle entitlements will be displayed on the licence. Existing tricycle riders will not lose their category B1 (trikes and quads) entitlement but it will be displayed differently on driving licences issued from 19 January 2013. It will be shown as category B1 and category A (restricted to tricycles), unless the rider already holds full A entitlement. Tests for mopeds with three or four wheels, A1 and A tricycles and sidecar combinations will only be offered to candidates with a disability. You will need to follow the same rules if you wish to ride a tricycle that falls within these categories. See text below as regards Trikes & Sidecars as regards people with disabilities. 23. Where can I find out more information? MAG Ireland has put together a list of popular motorcycles to show which ones fall into which categories, to give riders, a better idea of what this all means. They have also highlighted those full power motorcycles which can be restricted to meet the A2 licence requirements. As of January 19th 2013 Trikes will become part of the Motorcycle licence category. (Currently they come within the Car Category). For people with existing full car licenses prior to January 19th 2013, nothing changes. (New licensing rules cannot be backdated). After January 19th 2013 only people with disabilities will be permitted to take a test on a trike. (This dispensation is greatly due to consultations between the NABD and the Driving Standards Agency (DSA)* including the submission of a very detailed report by the NABD Chairman relating to the use of trikes and sidecar outfits by disabled people). A disabled person taking a test on a trike will qualify for a licence restricted to trikes. It will not qualify them to ride solo motorcycles or drive cars. Able-bodied people who don’t hold a full car licence prior to January 19th 2013 will have to pass a motorcycle test, on a motorcycle, before they can ride a trike. (Those who already hold a motorcycle licence will by default be able to ride trikes). Able-bodied people who are currently riding trikes on L-Plates must successfully pass a test before January 19th 2013. After that date they can only ride a trike if they successfully pass a motorcycle test on a motorcycle first. 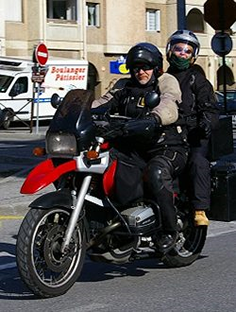 As far as I and the DSA are aware there is no change to the dispensation that allows disabled people to use a motorcycle and sidecar combination to take a motorcycle test, though this would also result in a licence restricted to motorcycles fitted with sidecars. Just been to the Bike Show (NEC), nice to see the industry is on top of this new legislation – seen my first quadricycle for 16 year olds (Moped) – well I would call it a two seater-car but I’m old school. If you head over to Right To Ride EU a bit of a report on the industry regarding new A2 Category motorcycle/licence and keeping on top of the new legislation. Now added – information from Rick Hulse – NABD (The National Association of Riders With A Disability) Chairman as relating to the use of trikes and sidecar outfits by disabled people). In UK and, as far as I can determine, other countries in Europe, cyclecars including three wheeled ones could until 19/1/2013, be driven on a car licence. There are two types of ‘tricycle,’ the three wheeled car and the motorcycle based tricycle with car rear axle and usually a large car engine. Having passed a motorcycle test at 24, you may now drive a three wheeled car having had no training driving a car unless you have also taken car driving lessons. I doubt it anyone who does not wish to be a motorcyclist will trouble to go down that long and irrelevant route to becoming a driver of a Morgan new or old, a Berkeley, a Reliant, a Grinnal…. and so on. On the other hand, quadricycles (which are in terms of seating position, controls and everything else, motorcycles,) are still in group B1 and can be driven on a car licence. It may be thought that the EC civil servants who write legislation were unable to frame descriptions to distinguish between the two varieties of three wheelers; HM Revenue and Customs have had no difficulty doing that. Why no response from companies, training establishments or the general public to the Consultation document on 2006/126/EC? Well, do you know anyone who saw it? Neither do Grinnal or the Morgan Motor Company. Regarding your comment, “Why no response from companies, training establishments or the general public to the Consultation document on 2006/126/EC? Well we certainly did and have reported on consultations on this Third European Driving Licence Directive which was agreed by the European Parliament in 2006. The various motorcycle lobbying organisations in the UK have also certainly heard of it since then and before. We may have been guilty of concentrating on motorcycles and to a certain extend trikes however that is what we do! However as far as I am aware and have been informed, this issue was raised to the European Commission officials who have confirmed the UK’s interpretation that practical tests for A1 and A are taken on 2-wheeled vehicles. Within category A are large tricycles, access to which is restricted to riders aged 21 progressive access or over or direct access at 24. So a three wheeled car such as a Morgan would be in excess of 15kW power and so would fall into the largest category of motorcycle. I know this doesn’t help much to resolve the issue but I would assume, although your comment suggests otherwise, that the likes of Morgan would have been lobbying, Government, Politicians and the European Commission. I see that Morgan are offering to provide a half-day driver development package completely free of charge to all UK buyers of a Morgan 3 Wheeler taking delivery of their vehicle from 1st March 2013, with European buyers and the rest of the world to follow later in 2013. As mentioned there and in an email I sent you, that I had followed this up by by speaking to the Driver and Vehicle Licensing Northern Ireland. They have recognised an issue with your comments and would suggest that the European Commission perhaps did not mean this to be included in the legislation and that it may be outside the spirit of the directive. In recognising this there may be room for the commission to change, so they are going to approach the commission to see what their thoughts would be on this. I hope this helps but if you have any further information that you might think would be useful in the meantime please get in touch. There is a stakeholders meeting coming up and I may have some news from that meeting. So you are over 24 have your car licence and want to go for your motorcycle full A category licence. Here’s the gist of a reply from, the DVA, to the question we were asked. If you are over 24 then you can go direct to the big bike (direct access) to do this you must first complete a CBT course in either A2 or A which allows you to be taught at higher speeds. You will need a theory test which can be taken before or after CBT. You must be accompanied at all time with an AMI (Approved Motorcycle Instructor) while riding the larger bikes. You will then need to do an off road manoeuvres test on the larger bike and a practical test. The fact that you have a full car licence has no bearing on CBT or the theory test. In most cases anyone going the direct access route will require a CBT certificate in either an A2 or A bike and a valid theory test is required. Regarding the issue of the new licence requirements for three wheelers /Tricycles/ cyclecars we have been informed that there will be a consultation published on the issue. As soon as we hear any more we will let everyone know.